To create motion in your electronics project, you can add a very useful device, called a servo, which lets you control mechanical motion with a BASIC Stamp program. A servo is a special type of motor that is designed to rotate to a particular position and hold that position until told to rotate to a different position. 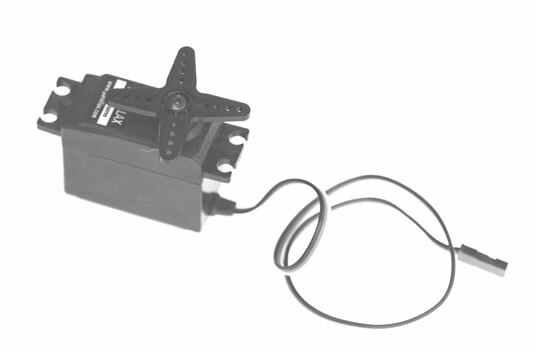 Hobby servos are frequently used in radio-controlled vehicles, but there are many other uses for servos. Here, a 1.5 ms pulse is sent to pin 0. Here are the PULSOUT duration values you should use for a typical hobby servo for various angles. Here is complete program that moves the servo to 45° when SW1 (a pushbutton on pin 14) is pressed and 135° when SW2 (a pushbutton on pin 10) is pressed.
' and returns the servo to center position when SW2 is pressed.